Which manufacturer sold the most at the 2010 Motor Show? Well, if you said Toyota, you are correct, with almost 25 percent of the total 27,878 vehicles being a Toyota. 6,943 Toyota’s in fact, so the recalls and otherwise bad press did not deter the Thai sales at all. And second? If you said Nissan you were right again. The sales figures for Nissan being 3,675. Undoubtedly the release of the Nissan March, Thailand’s first eco-car, helped vault Nissan up the sales charts. Third and fourth were interesting, with Isuzu (3,500) and Mazda (3,234) very close behind Nissan. 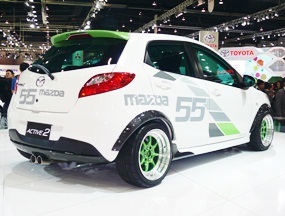 The new Mazda2 sedan would have helped Mazda’s sales. So where was Honda? The other Japanese giant was only 5th with 2,866 out the door, but since they really had nothing new, this was not surprising. Running further down the list was Mitsubishi with 1,404 sold, followed by Mercedes-Benz at 1,186, so the economic woes can’t be too bad in the upper echelons. The report did not say how many AMG SLS Gull-wings were ordered, however. I just hope someone bought one for me! BMW in a cocktail dress. Further down was the Malaysian Proton at 814, showing that they have certainly got the foot well and truly in the door in Thailand. BMW was next at 799, which is almost 400 shy of rivals Mercedes-Benz. This must be a continuing worry for BeeEmm, but this is still a company that thinks all it has to do is line up their models, with ladies in cocktail frocks and the public will knock them over to buy. Time for some imagination, BMW, the display looked exactly the same as 2009, 2008, 2007…..
Down the bottom of the list were Gem cars (electric golf buggies by another name) who sold nothing, Lotus (three sold), the nauseating Mitsuoka who found seven people with no taste and then Mini, Lexus, Peugeot and Subaru in double figures only. Last week I asked which driver has won the German GP six times? The answer was not one of the present day overpaid auto-jockeys, but Rudolf Caracciola in the Mercedes-Benz at the old, and feared, Nurburgring circuit. Regular contestant Ivar Hoylem was first in and correct. So to this week. The US GP of a few years back started with six cars only and was a farce. However the 24 Hours of Le Mans started one year with only 17 cars. What year was that? Mitsubishi are well on the way to offering one of the first ‘all electric’ small cars on city streets. Whilst still not slotted for release in Thailand, it is going to be available in Australian showrooms later this year. 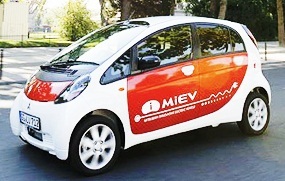 Small cars generally come with small engines, but the i-MiEV replaces the mid-mounted petrol engine found in the Japan-only Mitsubishi ‘i’ upon which it’s based with a 47 kW/180 Nm electric motor that drives the rear wheels and is powered by a 16 kWh lithium-ion battery pack under the rear seat and boot floor. Those who have driven production models of the i-MiEV noted that in the 1080kg i-car, the result is instant throttle response and brisk acceleration from just about any speed, making the i-MiEV more satisfying – at least in a straight line – to drive than most other small cars. In ‘Brake’ mode , delivers both maximum performance and maximum ‘engine’ braking with enough retardation to make braking unnecessary if you read the traffic right, while also maximizing energy regeneration. It has an electronically limited top speed of 130 km/h (Mitsubishi says it would otherwise do 160 km/h), and Mitsubishi’s all-electric pioneer is also suitable for short freeway runs. Go Auto in Australia drove a production i-MiEV exclusively within the city of Brisbane , and reported that unlike nearly anything else on the road, the i-MiEV makes only wind and tyre noise, and a seamless wall of readily accessible torque from any speed in almost complete silence. Truth be told, the i-MiEV’s eerie silence went barely unnoticed within the bustle of even Brisbane’s city streets, where streams of noisy traffic reduced the ground-breaking Japanese hatch to being just another small car on its way to somewhere else. Coupled to solar panels at home, however, there’s no reason i-MiEV owners can’t be fully self-sufficient in terms of their automotive energy consumption by using power free from the sun. Unlike their Japanese counterparts, individual Australian i-MiEV owners will not have a fast-charge option, which can deliver an 80 percent charge in 30 minutes by connecting a different cable between a 200-volt or three-phase power outlet and an inlet port in the left-rear of the car – rather than the right side for regular charging. However, Mitsubishi says none of this is a problem because fast-charge stations are expected to eventually be installed at many office, residential and shopping locations, and a full range of up to 160 km should easily accommodate most city dwellers on any given day. Like mobile phones, Mitsubishi expects EVs will most likely be charged overnight. The trickle-charge rate is expected to be just seven hours. While a digital battery charge meter takes the place of a traditional fuel gauge and a large central power consumption gauge replaces a speedometer, the i-MiEV features keyless ‘starting’ like many other models these days. Simply turn the dummy key on the steering column and the ‘ready’ light illuminates on the instrument panel to advise the car is ready to drive – just like the Toyota Prius. The i-MiEV complies with the Japanese kei-car regulations, including a total length of less than 3400 mm and width of 1600 mm. That makes the i-MiEV almost as small as a Smart, and smaller than top-selling B-segment cars like Toyota Yaris, the Mazda2, Hyundai Getz and Ford Fiesta. Naturally, space is therefore limited in the i-MiEV, which appears even smaller in the metal than you’d expect but compensates somewhat for its tight elbow room, upright seats and cramped rear legroom with a tall roof that gives decent headroom. There’s no getting away from the i-car’s utilitarian roots as an affordable Japanese runabout, however. Hard plastic surfaces abound in the funky but functional interior and the hard seats offer limited adjustment up front, even if there is a modicum of luggage space behind the rear seats. Like any car with a wheelbase this short and wheel tracks this narrow, fore-aft pitching is brutally apparent over pavement joints you’d never notice in a larger vehicle. The i-MiEV’s steering is best described as wooden and, despite a refreshingly firm suspension set-up that returns minimal bodyroll, the tall seating position and high perceived centre of gravity do not inspire the confidence to test its cornering grip. Looking at the i-MiEV as a proposed city car, the projected initial price of up to $70,000 puts it in the same bracket a BMW 320d, and is therefore likely only to attract well-heeled early-adopters that want to broadcast their environmental conscientiousness. Since the (high) cost of electric vehicles is inextricably linked with the price of batteries, which in turn is dictated primarily by production volumes, the price of the i-MiEV and a host of other imminent new EVs will eventually come down. In the same way prices of plasma-screen TVs have plunged in just a few years, Mitsubishi expects the i-MiEV to cost less than a Prius by the time it’s widely available. Mitsubishi says that although it also shares its basic architecture with the petrol-powered i-car, the i-MiEV is the product of a 10 year development program and is built in the factory from the ground up as an electric vehicle, rather than being created in an aftermarket conversion. With an influx of other EVs from Japan and China – and the plug-in Volt hybrid from GM, the i-MiEV’s success could well hinge on how soon it hits local showrooms. Mitsubishi is betting against global demand to make that happen sooner or later, and hopes the i-MiEV will become to EV what the Prius is to hybrid. Of course, the i-MiEV is far from perfect and will never replace petrol or diesel power as a means of long-distance travel, let alone for traversing vast, rugged continents like Australia. However, given the refreshingly crisp performance on offer in a vehicle that is bound by Japanese kei-car regulations, which include limits on vehicle size and power, the i-MiEV is a tantalizing taste of larger, more powerful and eminently more versatile EVs to come.